Set 8459 is nearly the perfect Front End Loader. In fact, it is so good that it was re-released in two future years. The list of firsts and bits of scale accuracy are large. There had been many front end loaders before, but this is the first and only pneumatic version. 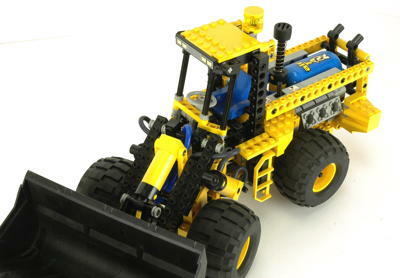 It is the first with four wheel drive and the first Technic model with an articulated chassis. It does nearly everything right including the scale range of motion, scale cabin, drive system, steering wheel, and accurate side and rear details. The huge 18x10 bucket was new for this model. It still stand up easily to the much newer and larger loaders of decades later. The model is constructed mostly of traditional plates and Technic bricks with just a few studless parts thrown in here and there. It is a very solid model and eminently playable. 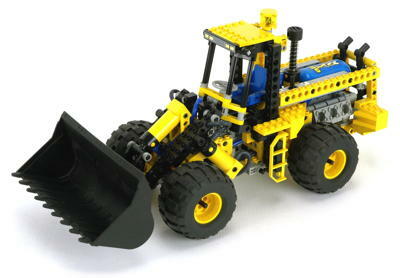 If I could have only one loader in my collection, this would be the one. The later versions are identical in design but vary in packaging and instruction decoration. The model features a robust pneumatic system with three large actuators, two switches, one pump, and an air tank. As shown in the computer image, the air tank is in series with the supply which then splits to go to the two switches. The right hand switch output is shown in orange and red and controls the bucket lift actuators in parallel. The left hand switch output is shown in green and turquoise and controls the bucket dump actuator. The air tank has the capacity to store about 4 bucket motions or 2 lifts before needing to be refilled. The pump is conspicuous behind the cabin, but the switches are nicely hidden in the side rails and the air tank could represent a propane storage tank from a real indoor loader. The tubing is routed inside the structure so that it is mostly hidden and well supported. 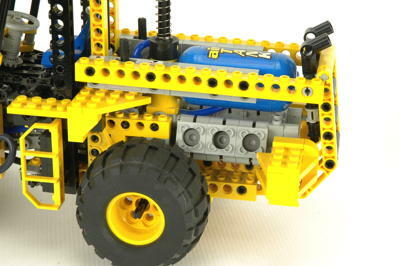 The pneumatic system in this model is among the most realistic in Technic. 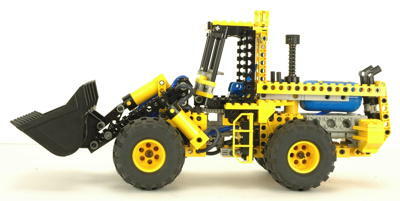 It mimics the function and geometry of the hydraulic system in a real front end loader very well. 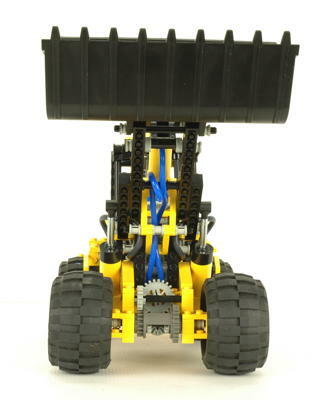 The chassis is articulated and can be steered with an overhead "hand of god" control. The driver's wheel also turns. A huge 40 tooth gear is used as a sort of turntable on the articulation axis and also provides 5:1 reduction from the input. The motion is smooth and perfect. 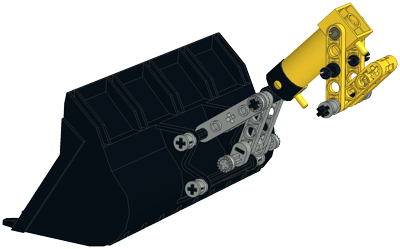 The front bucket can be lifted with a parallel pair of pneumatic actuators. The speed and power of the system is quite incredible. In fact, it is nearly impossible to force the arm down without damaging the parts and therefore the load lifting capacity is considerable and probably limited by balance rather than power. 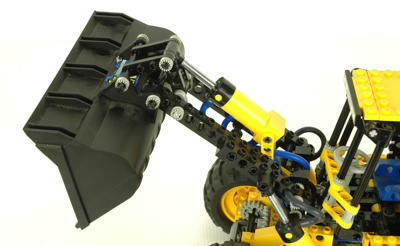 When the arm lifts, the bucket angle remains relatively constant as can be seen in the animation. This is due to the Z-bar linkage on the dumping mechanism. 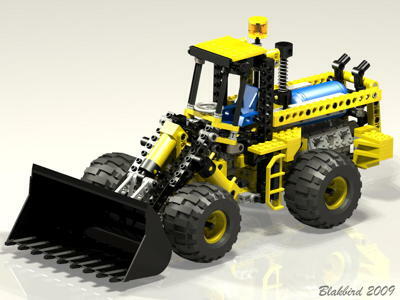 Click for an animation of the bucket lifting. 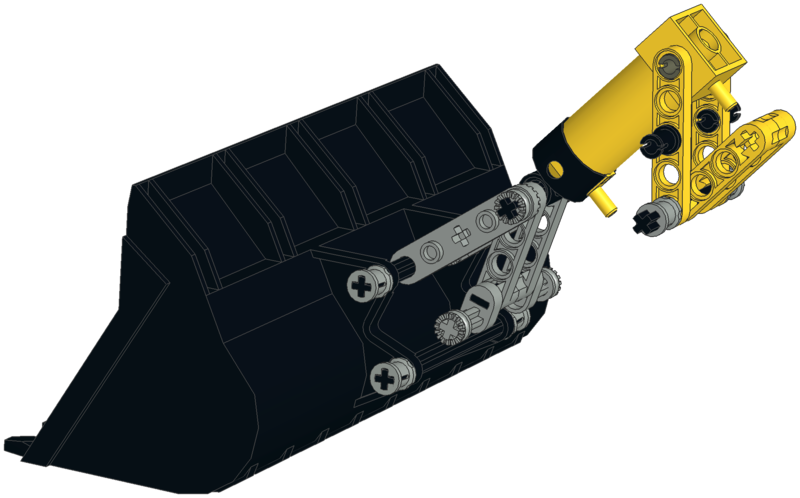 The front bucket can be dumped via a single pneumatic actuator which is mounted to a z-linkage to keep its motion independent of the arm. The bucket dumping has relatively little power compared to the lifting, but that is as it should be. The range of motion is just right for scale. Click for an animation of the bucket dumping. 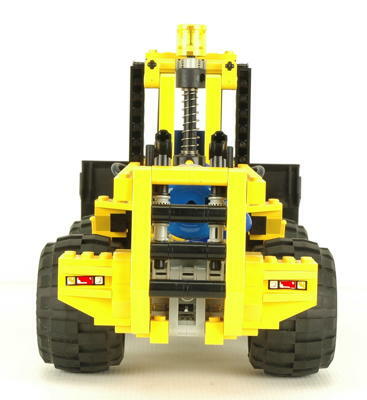 This loader features a V-6 engine hidden under the air tank and behind the rear wheels. This is just where the engine is in a real loader so it can counterbalance the load. Click for an animation of the engine in motion. This set is true four wheel drive and uses a front and rear differential but no center diff. The differential gears incorporate a built in 16 and 24 tooth ring gear. 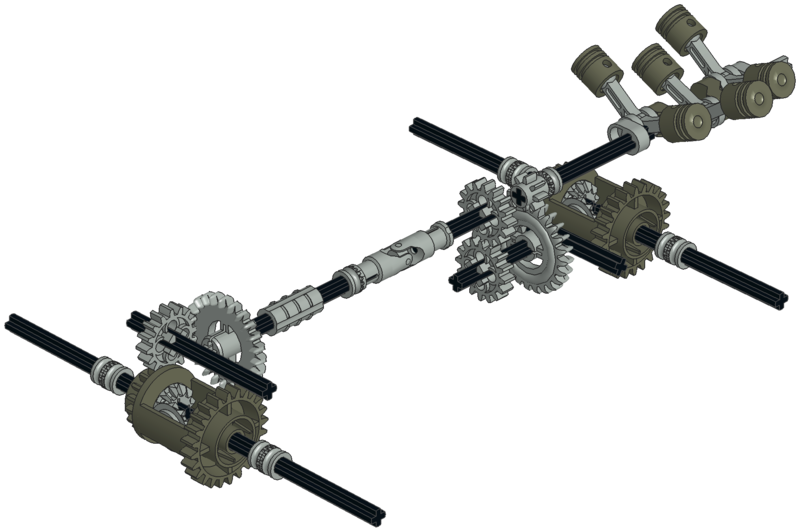 The differentials are made to house 3 of the 12 tooth bevel gears. 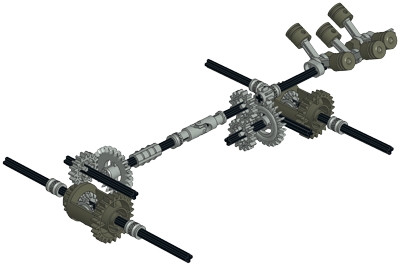 One is on each axle, and one planet gear in the middle allows the axles to turn at different rates which is particularly important with the articulated chassis. 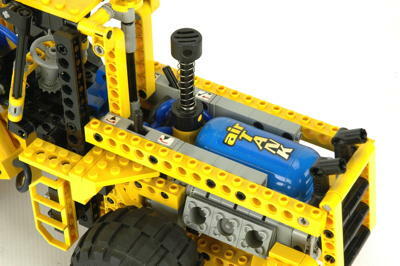 The front and rear axles are connected together with a universal joint which is precisely on the articulation axis. Click for an animation of the differentials in motion. 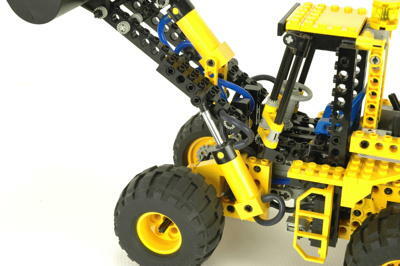 This set uses 4 of the large 68.8 x 40 balloon tires and wheels.